Social media has been on fire over the racist remarks from L.A. Clippers owner Donald Sterling. TMZ has released a recording of Sterling's phone conversation with girlfriend V. Stiviano, who is half black and half latina, of him getting angry that she posted a photo on Instagram of her and Magic Johnson. No, he wasn't accusing her of catting around....he was angry that she was taking pictures with African-Americans. Well, this has pissed off a lot of people and rightfully so. TMZ Sports says they "obtained audio of Sterling making the racist declaration during a heated argument on April 9th with V. Stiviano ... after she posted a photo on Instagram posing with Magic. Sterling rails on Stiviano, for putting herself out in public with a black person (she has since taken the pic down). But it doesn't end there. You have to listen to the audio to fully grasp the magnitude of Sterling's racist worldview." Beyonce has had quite the year and it's only fitting she landed the cover of Time magazine's 100 Most Influential People. However, I feel they could've taken a more flattering photo of her. Seriously. This looks like Kate Moss Calvin Klein ad circa 1993. I want glammed-out Bey! Beyonce joins this year's other honorees — director Robert Redford, General Motors CEO Mary Barra and out basketball player Jason Collins — who will be featured on the magazine's multiple inside covers. Those covers, all black-and-white shots as well, are featured inside the double issue. Yonce took to social media to humbly accept this honor, saying "I am grateful for this honor🐝"
More and more I hear about this movie in the works, the more giddy I become! We now finally know who will play Jem and her holograms and to add to the excitement, director Jon M. Chu released a photo of the crew in their makeup. Thanks to TooFab for posting this, which totally made my day. 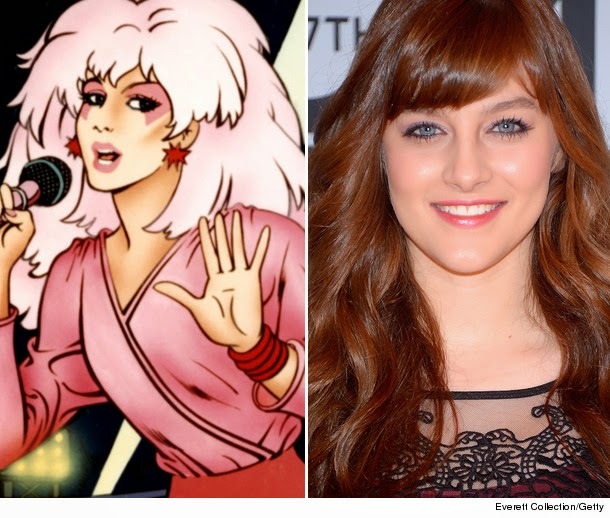 Aubrey Peeples will be playing the pink-haired leading lady. Peeples is most well-known for her role as Layla Grant on Nashville, which shows the actress' singing chops! 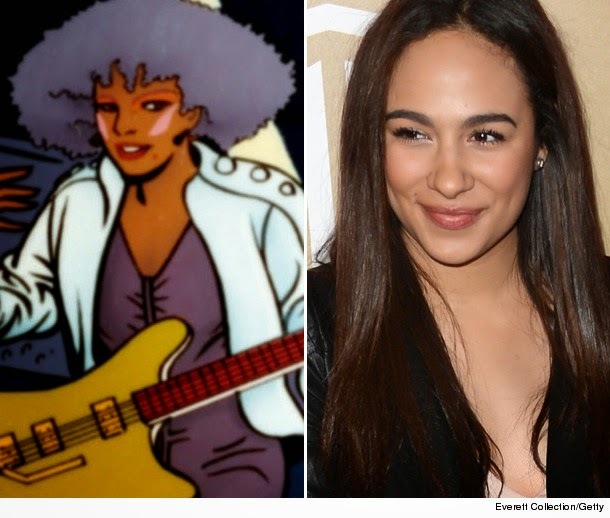 I cannot wait to hear her belt out the Jem theme song. Stefanie Scott will take on the role of Kimber, Jem's annoying younger sister and keyboard player for the Holograms. Scott has starred in Disney Channel's A.N.T. Farm and, also released a number of singles while working for the network. 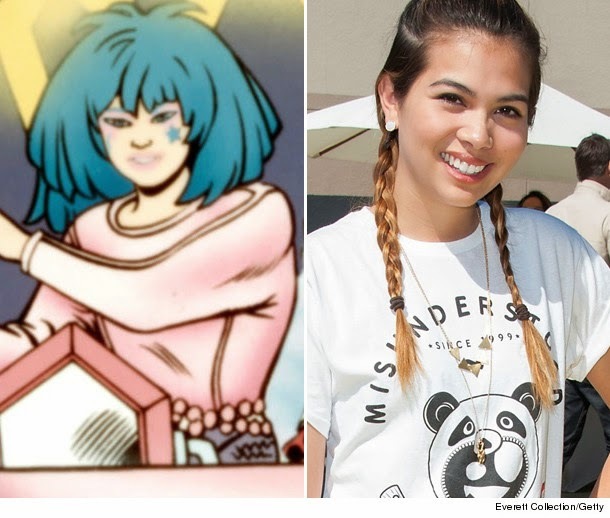 Another former Disney star, Hayley Kiyoko, who will play Aja. Aja is on the drums and doesn't mess around on and off stage. Too Fab says, "Hayley previously starred in the Mouse House film Lemonade Mouth and currently appears on ABC Family's The Fosters. She also has performed with bands like Hede and The Sunners and released her own solo EP in 2013." Aurora Perrineau, who was cast as Shana. Too fabs says "she appeared in the 2013 film A House Is Not a Home and is the daughter of Lost star Harold Perrineau." Now if they can just tell me who will play The Misfits, Synergy and Rio! Takes me back to JV girls basketball warm-ups on game days. Hello junior high! I used to LOVE angry Eminem back then. Man, I wish Kanye and Keyshia would go back to this greatness. This song right here along with the video are everything right now! What girl from the 90's doesn't like Clueless!? I never gave Iggy Azalea the time of day before, I just figured she was just another female rapper who was trying to follow in Nicki Minaj's shoes. I know, I know.....I was wrong. I should support my fellow females, especially since Azalea works with T.I. !